The last few weeks have seen a dramatic upswing in protests against the East West Link tollway, which is estimated to cost $6–8 billion. The communities around Clifton Hill, Collingwood and Carlton have not been content to simply look on while the Linking Melbourne Authority carried out geotechnical drilling in the area, and have sought to block, disrupt and stop the operation. Early one morning in response, the Napthine government sent scores of police into suburban streets to guard these works and prevent further disruption. Over the last couple of days, however, the protests have been successful in stopping the drilling. More than likely, Linking Melbourne will now put the onus on whichever construction consortia is successful in tendering for the project to carry out any final testing that is required. There is a long history of urban communities and neighbourhoods fighting vested interests – be they the state or private corporations – over competing visions of what the city might look like and how it provides access to housing, transport and other amenities. Cities are one of those important sites for contrasting ideas about how a society should be structured and organised. In the 1970s and again in the 1990s, the area around Alexandra Parade has been the location of struggle over the building and extension of the Eastern Freeway into inner northern suburbs. The campaign’s latest phase gained immediate momentum in July this year when the Liberal government reneged on its election undertaking to prioritise public transport, and released details of the proposed route for the first stage of the East West Link tollway – 96 homes and 26 commercial premises would be bulldozed. The media announcement shocked many residents and business owners for whom this was the first inkling of impending disaster. A 3D ‘drive through’ simulation revealed the first stage of the 6km tunnel would extend from the Eastern Freeway, then run under the Melbourne Cemetery and Royal Park to join CityLink at Moonee Ponds. At either end ventilation stacks loom – uncomfortably close to a primary school at the Clifton Hill end. Large sections of Royal Park stand to be lost under an enormous spaghetti arrangement of onramps and carriageways at Ross Straw Field, encircling a brand new apartment building. Heritage streetscapes would be demolished just to build a temporary road during construction; a whole street in Collingwood would be lost to an onramp. Without any clear mandate, the Napthine government presented the project as a fait accompli, essentially to demoralise dissenters. Napthine promised contracts would be signed only weeks prior to the next election. Meeting this target relied on new legislative changes reducing the extent of public consultation and impact assessment. Clearly, Napthine’s vision for Melbourne is driven less by rational planning considerations and notions of democratic access than a set of private interests with vastly different priorities. Despite initial shock, communities of the inner north rallied quickly in response. The Yarra Council has expressed opposition to the tollway since late 2011. 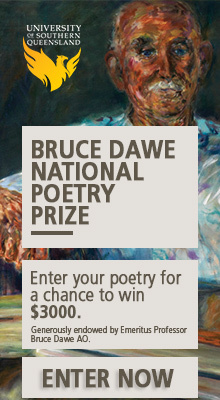 By July this year, it had allocated $200 000 to its ‘Trains not Tolls’ campaign. Protest meetings ensued, with the support of Lord Mayor Jackie Fristacky and Socialist Party councillor Steve Jolly, along with letters, petitions, consultation meetings and the like. Community groups such as the Collingwood and Abbottsford Residents’ Association (CARA), Yarra Climate Action Now (YCAN) and transport action groups including Yarra Campaign for Action on Transport (YCAT) – which had long been campaigning against this tollway – reactivated around this issue. New groups and coalitions like the Residents Against the Tunnel (RATs) also appeared. Opposition also came from many concerned residents, neighbours, community members, and independent activists. The inner north of Melbourne is hardly Liberal heartland, and so the East West Link emerged as an issue in the federal election. Socialist Party candidate Anthony Main made it a centrepiece of his campaign, while the Greens’ Adam Bandt spoke often about the need to prioritise public transport over road projects. The Victorian ALP eventually made its opposition to the project clear, while indicating they would honour contracts signed prior to the election. The ALP’s position made it difficult for locals to see how there could be any electoral means to stop this project. One group noticeably missing in action have been the unions (with the notable exception of the Fitzroy-based United Firefighters). There was a time when building unions would have aligned themselves in support of such a campaign. But such is the parlous state of union leadership. They have thus far lined up with the Liberal government for the East West Link, looking to the jobs it will provide – which means overlooking the attacks this government has mounted on such unions, the industrial action restrictions that will be imposed on the project, and the vastly more numerous jobs available if the money slated for this project were instead directed to building and running public transport. It is not only the destruction of and potential damage to homes caused by the tunnelling making local residents and supporters angry. Nor is it just the actions of a government circumventing legislative requirements in order to rush the project through without facing an election over the issue. There is also the secrecy of the business case, especially since the earlier Eddington report on east west transport needs had raised serious doubt about the economic benefits of such a project. The taxpayer is to underwrite any losses on this massively expensive tollway, and the recent financial difficulties of tollway projects in Sydney and Brisbane don’t give much cause for comfort here. Also at issue is how investment in the project will divert funding away from much needed public transport initiatives for years to come. The Metro Rail plan, which includes the long-promised rail line to Doncaster, is one alternative that would alleviate the gridlock along the eastern freeway at much less cost. There is also doubt over the extent to which a link to the west would solve this gridlock given the amount of traffic that exits at Hoddle Street. Each week it seems, some new concern emerges from the proposed tunnel. There have been recent reports about the disturbance to animals in the Melbourne Zoo given that its location is merely a few hundred metres from where the western entrance to the tunnel will be built. The new phase of the campaign against the tunnel tollway was signalled in August, when Yarra Council refused the Linking Melbourne Authority access to council-controlled areas to undertake the drilling that would provide geological information to the construction consortia bidding for the contracts. The Roads Minister, Terry Mulder, subsequently used his authority to order them to comply. Escalation of community action was very timely. Local people had written letters, gone to the Linking Melbourne community consultation meetings, attended rallies and protest meetings of various kinds, and held up signs by the Hoddle Street freeway exit. The lack of any real response to community concern by the government, along with the rush to have the project finalised, made the need for more direct action seem like an idea whose time had come. For three weeks in late September and early October residents came out to attempt to picket and disrupt this drilling at a number of different sites near Alexandra Parade. There have been around 50 people willing to come out regularly at 6.30 am and a wider group of supporters able to also attend and support when they could. The mobility of these pickets in moving from site to site as well as their local connections and knowledge were important resources. The mood was good humoured, mutually supportive and determined. Meetings and democratic decision-making were carried out on the spot (the experience and skill of local Socialist Party organisers Anthony Main and Mel Gregson were real resources here). As a result, picketers managed to halt drilling for the first week while authorities and police worked out how to respond. In the second week, cages of tall wire fences, with barbed wire strung along the top, began to surround the workers and the drill rigs – concern about occupational health and safety aspects for workers is clearly not a priority for the Linking Melbourne Authority. A second drill rig was deployed. The Napthine government sent out the police in increasing numbers. Nevertheless, protesters turned out in all weather and stood their ground in a determined and non-violent manner – and successfully slowed and disrupted the drilling process. On the Monday of the third week, police knocked Keith Fitzgerald, a 70-year-old resident of Collingwood who faces losing the house he has lived in for 69 years, to the ground. A Linking Melbourne official was often on site, deaf to enquiries of residents and invitations to ‘consultation’, and appeared to be directing police in the removal of residents like Keith. Meanwhile, the protesters set up a caravan and stall on a drill site at the corner of Westgarth and Brunswick streets in Fitzroy. This created a lot of interest, with passers-by stopping to chat, take a leaflet and sign the pledge to undertake direct action against the project construction. Social media played a prominent role with the twitter handle @yarra_campaign, the #tunnelpicket hashtag and the YCAT website keeping people informed about developments. Local activist Sean Bedlam shot and edited a video diary of each day and uploaded it to YouTube. Sometime at the end of the second week, a livestreamer by the twitter name of @louistxt, appeared unbidden to live stream hours of the protests. As is usual for such things, the old media gave the picket mixed coverage. The Today Show did a live cross for one of the largest early morning turnouts of local people. The Herald Sun did its best to demonise and ridicule, paying Anthony Main the reverse compliment of putting him on the front page for a history of engagement with social justice issues. In the last few days, the campaign has had a significant win in forcing the Linking Melbourne Authority to abandon the rest of the scheduled drilling. Earlier in the week, veteran of the 1970s protests against the building of the freeway, Tony Murphy, broke into an unguarded cage and locked himself onto the drilling rig. The whole process was livestreamed and Tony gave media interviews from his perch on top of the rig. This halted the drilling at all sites, stopped the rig being moved to the final sites that had been marked up just prior and precipitated the decision to abandon drilling. The campaign strategy has been extremely effective thus far. The timing around the project is crucial so anything done to slow or pressure it in any way will have significant impact. The government is weak and vulnerable: it has tied its fate to the project and we are just one Geoff Shaw resignation away from a new election where the East West Link would play a major role. The campaign is building links and activity within the community, testing support, and building potential for further action. Each phase of this project can expect to be met not just with empty or symbolic opposition but with an attempt to stop it in its tracks. Protesters have also put on notice those companies and investors bidding for the contract that part of the cost they face is implacable and dogged opposition from the local community. There is nothing but headaches in store for the companies involved. There will be a community rally this Sunday, from which the next phase of the campaign will grow. The attempt to stop a multibillion-dollar project like this is no small ask and will depend on turning widespread latent support into something more. There will be legal challenges. There will be pressure on the ALP to tear up the contracts. But the feeling of optimism around this campaign stems from the potential to mobilise not just those directly affected, but also those who believe the structure and organisation of urban spaces matters to all of us. 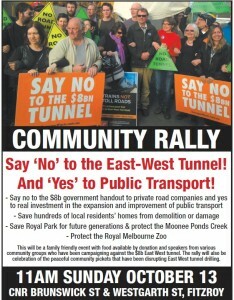 The rally this Sunday 13 October – ‘No to East West tunnel – yes to public transport!’ – begins at 11:00 am at the corner of Westgarth and Brunswick streets, Fitzroy. Many thanks to Sean, Steve, Jill, Anthony, Kat and Jennifer for discussing the campaign with me. They are not of course responsible for any particular interpretation by me. Gary Pearce lives and works in Melbourne. Great article, Gary! A good summary of the campaign so far. The final cost could be near $ 14 billion as it is a two stage plan. Estimates are that it will need an average toll of $ 10.50 to be profitable. But with the state govt collecting tolls, the builders will be paid an agreed amount regardless of the actual revenues from tolls. Thank you so much for this terrific article. So useful to get up to speed on all this and capture the feel of the protests – from a one-time resident of Melb’s inner city. Saw you on ‘sunrise’ today ~ and tried to get back to them pointing out a basic error in Kock’s argument ~ but they appear to have separated themselves from the public. The point was that building all these roads does NOT alleviate traffic volumes ~ it exacerbates the snarls.